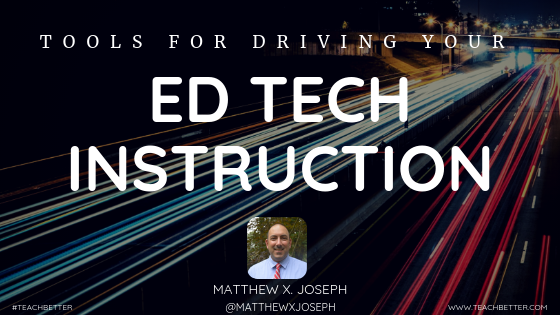 How are you driving your Ed Tech instruction? When the song “Life is a Highway“ comes on, it is one of those songs you turn up a little, maybe even smile, roll down the window, and sing the chorus. One line sticks out to me “Life’s like a road that you travel on.” I hear this and think there is a parallel to education. We have around 180 days each year to drive our students’ learning. Think about a highway. There are fast cars, some slower cars, cars trying to pass, and some cars stuck in the breakdown lane or pulled over lost. Sound familiar? Like a classroom? If you are on the highway and need to know where you are going, what is the first thing you do? You open your GPS and add the destination, and a map will show you the way. In education, our GPS is our lesson plan. We know where we want to go, and we set a course to get there. A solid lesson plan should provide you, the teacher, the direction and the ability to visualize the path of learning that consists of the “what, why, and how” of the teaching-learning activities. Your lesson plan is a sequence of well-organized learning experiences that connects instructional events. I believe an effective lesson plan also provides opportunities for students thinking to be visible, and allows them to interact and ask questions, tap into their background knowledge, and build new skills to make connections to a real-life situation to practice critical thinking skills. The use of real-world scenarios will increase rigor, relevance, and critical thinking. This often is when “technology” is put into a plan as an activity. While I am a huge advocate for the purposeful integration of technology in schools, we must resist the temptation to think that this is the solution to solve all the ills in our current education system. Using technology just for the sake of “using it” equates to a huge waste of instructional time. Sometimes when teachers make a plan that includes educational technology, learning can become secondary to the tech. When building a lesson plan, we should never ask, “What am I going to do with _________ today?” (Insert iPads, PowerPoint, Kahoot, or any tool you may want to use in the blank.) Our goal is to plan a lesson using technology to enhance learning not take the place of teaching. Innovative instruction is not only about “thinking” differently, but also “acting” differently. This year, let’s work to include innovative ideas and activities into lesson plans. Most students know how to use technology. However, we cannot assume that they know how to use technology to support their learning. This is where the attention to sound instructional design is necessary. Start with a pedagogical foundation in the plan, and then add the Ed Tech. This will set the stage for students to truly begin to own their learning in ways never imagined. The key is to determine what we want our students to know, and then let them have a choice as to how they will demonstrate or apply their learning. This not only adds relevance and meaning to the learning, but also takes the pressure off the educators from having to learn how to use an endless number of tools. There must be more of a concerted focus when building lessons, on learning outcomes, construction of new knowledge, leading to authentic application, and the development/enhancement of essential skills (creativity, critical thinking, problem solving, digital citizenship, entrepreneurship, media literacy, technological proficiency, communication, collaboration). Think back to that Tom Cochrane song “Life is a Highway” … “Education is like a road that you travel on” and we can use our instructional #GPS to ensure educational technology is planned to enhance learning. I use GPS as an acronym to support this method of planning. The learning content which is characterized by the subject matter guidelines. Bottom line – what do you want the student to learn by the end of the lesson? Develop a sequence of well-organized learning experiences, that provides for a variety of instructional checkpoints. Ensure you include the opportunity for higher level questioning. Your plan should provide direction and comprehensive, integrated, and meaningful content at the appropriate student level. Does my plan match the learning goals? What is the impact of what we are learning? What resources exist to support learners? These questions help drill down to develop a plan that will enhance your goal while providing opportunities for student learning. Technology can become a nice pedagogical fit when viewed as supporting and enhancing instruction. When it comes to implementing Ed Tech, we must always ask ourselves how the tool will support learning. Now, you have set your Goal, designed your Plan, and matched the learning goals with Support tools. So I want to also provide you with a list of some great educational tech tools that I recommend. Click here to view recommended Ed Tech tools and links to resources and the tools to begin using in your lessons. Each learner has a unique learning style & unique requirements. Our role as educators is to match those needs with tools and techniques. There is a paradigm shift in learning. I see digital learning as a technique that is facilitated to effectively combine different modes of delivery, models of teaching, and styles of learning with digital tools. Applying this technique in an interactively meaningful learning environment starts with a dynamic lesson plan, and setting the GPS to drive your instruction. About Matthew X. Joseph, Ed.D. Dr. Matthew X. Joseph is the Director of Digital Learning and Innovation in Milford Public Schools (MA). Previously, he served as an elementary school principal for 11 years, which givens Matt incredible insights on how IT can best support teaching and learning, for which is recognized nationally. Matt holds licenses in education, administration, and MA superintendent. His master’s degree is in special education and his Ed.D. in Educational Leadership from Boston College. Matt is an accomplished writer in the EdTech space with articles featured in Tech and Learning Leader (blog), eSchool News, and EdTech K-12 and he regularly presents at MASSCUE, ISTE, and many other regional and national events. At FETC 2019, Matt will present “Blitz Educational Transformation” in the FETC 2019 IT Track and serve on the “From IT to Innovation” panel. Blog header image photo by Guillaume Jaillet on Unsplash.